Over the last few months, an exciting new event has started taking place in Addis Ababa on the first Tuesday of every month at Asni Gallery, called ChangeMaker Tuesdays. The event aims to bring together individuals interested in sustainability in its broadest sense, to learn from one another and hear from an inspiring ChangeMaker – defined as someone who is making a positive difference for society and/or the planet. In the last month, Addis has hosted the international Financing for Development Conference, focused on how the world will finance the new Sustainable Development Goals – the successors of the Millennium Development Goals. It seems fitting therefore that as the world’s leaders are looking at everyone’s responsibility to make this world a better place, we interview Amy Bolger, one of the founders of ChangeMaker Tuesdays, which is inspiring and stimulating action among the next generation of leaders. Amy has been living in Addis Ababa for over a year, initially to volunteer for the Ethiopian Midwives Association through the Australian Volunteers International. Now, she’s taking some time to invest her energy into other projects she’s passionate about, and ChangeMaker Tuesdays seems to be the top of her ‘to do’ list. Can you please explain what ChangeMaker Tuesdays is and what it aims to achieve? 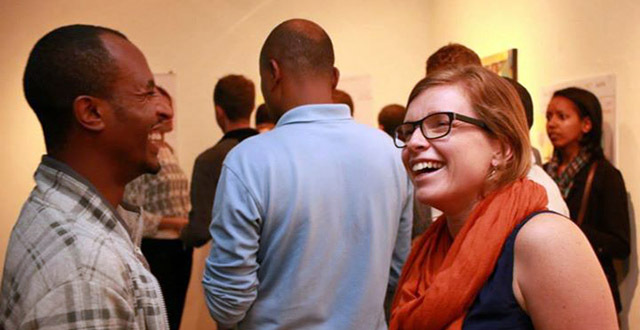 Well, ChangeMaker Tuesdays is an informal network that gathers together once a month on a Tuesday (which is lucky, because meeting on Wednesdays wouldn’t have worked well with our name!). We’re all about inspiring conversations, which works in two ways. Firstly, we invite a ChangeMaker to our monthly events to give an inspiring talk about their journey towards creating positive change. Secondly, we aim to inspire conversations among those attending our monthly events – conversations about the kind of change they want to see in Ethiopia and in the wider world, and how they will contribute to achieving it. What was the purpose of setting up the group and how did you go about it? Since moving to Addis last year I have heard many stories about inspiring people working at grass-roots level, and creating positive change for people and the planet. These people I was hearing about covered a varied range sustainability issues, including creating recycled paper from banana leaves, building eco-lodges from rammed earth, or setting up vocational skills training to support girls who haven’t completed their education. The more of these stories I heard, the more I wondered why there wasn’t a platform in Addis, like Green Drinks, through which they could tell their stories. In addition to this, I thought Addis could also do with an informal platform for people, especially young aspiring leaders, to get together and share ideas as well as learn from and be inspired by our guest ChangeMakers. I talked to a few friends about creating such a platform, and before I knew it, we had a committee of six co-founders. Everyone on the committee is passionate about sustainable development, and each member brings their unique skills to the group. With this dynamite team, we pulled together our first ChangeMaker Tuesdays in June 2015, which was a great success – we were overwhelmed with the turnout and response from those who attended. The overall response was ‘keep going – we need this in Addis’. Who makes up the ChangeMaker Tuesdays’ organising committee, and what do they bring to the group? The founding six members consist of myself who likes to lighten the mood of each event with bad jokes; Tom who’s a sustainable development aficionado, keen photographer and the brains behind many of my bad jokes; Muluken who keeps us connected and fuelled with ideas; Ben who’s a solar technology and renewable energy guru; Sasha who’s our creative force and networking specialist; and Joanna, who supports our planning and communications. After the first ChangeMaker session in June, we approached Yeabsira and Tatek who are both part of the Horn of Africa Leadership and Learning for Action programme, and were keen to get involved. They complement our group dynamic and skills perfectly, bringing with them some impressive links to the right networks and endless enthusiasm and energy. We hope they’ll ensure the ongoing sustainability of ChangeMaker Tuesdays. You’ve had an impressive turn out for your first three sessions. Who is your target audience? We are aiming to attract like-minded people who are interested in hearing about and/or creating the positive sustainable change needed to address the many challenges our planet faces. We would particularly like to inspire the young leaders of Ethiopia. We’ve had a varied range of people attend, everyone from Ambassadors to school students, Habesha’s and Farenji’s (the affectionate title given to all foreigners in Ethiopia). How do you chose who will speak and themes for each month? When we first started discussing what ChangeMaker Tuesdays would look like, everyone had ideas about who they would like to have speak – people they’d heard about from friends, read interviews about, or had the pleasure to work with. As a result of this enthusiasm, we started with a long wish-list of potential speakers, and we’re constantly adding to it. Each month we look through the list and focus on someone from a different sector. For example in September we have invited a ChangeMaker to speak about Ethiopia’s Slow Food movement and in October we will hear one girls story of how an Addis based NGO have supported her and other girls returning from their experience as domestic help in the Middle East. Each speaker we have approached has been so willing to be involved; our biggest challenge is deciding who to approach…which can be hard when you have a list of so many inspiring people in front of you! How do you involve attendees in each session? Each month our agenda includes time to mingle (the less formal version of networking!) both at the beginning and end, and one committee member will come up with an interactive activity for people to do in groups. We see this as an opportunity to spark conversation, meet new people and understand different perspectives on issues and life. We place a lot of emphasis on having fun. As well as this, the committee will do an introduction to engage the audience in discussing issues relating to the speaker. For example last week, our health related speaker inspired an introduction on the importance of technology and innovation in addressing key and endemic health issues. We also allocate time for a Q&A with the speaker, giving the audience the chance to ask the speaker any questions they may have about their project or journey. What role do you see ChangeMaker Tuesdays playing in Ethiopia’s sustainability movement? ChangeMaker Tuesdays was established to compliment the Sustainable Development Goals by promoting and inspiring action in many of the areas the new goals focus on. The goals are grouped into 17 ‘themes’, and so far, our three speakers have touched on three themes including ‘Good Health’ with Dr Yohans talking about founding Hello Doctor, ‘Responsible Consumption’ with Tesfaye’s paper recycling business and ‘Sustainable Cities and Communities’ with Sosina’s Gamo Circus School. We see the Sustainable Development Goals as tools that are getting individuals involved, from all walks of life and every country in the world, in making this planet a better place. ChangeMaker Tuesdays has a very similar ethos at its core – we’re about sharing and exploring sustainable development solutions, inspiring action and inspiring the next generation to take the plunge and in the words of the great Ghandi, ‘be the change they want to see in the world’. Where would you like to see ChangeMaker Tuesday’s in five years’ time? We’re an ambitious committee, and have so many ideas already, despite only being three months in! One thing we’ve always agreed on, is that ChangeMaker Tuesdays should evolve and change depending on what attendees want it to be. It should be led by them, and as someone that won’t be living in Ethiopia forever, it needs to be Habesha led and directed. We ask at the end of every session for feedback, so I hope that in five years’ time, it will look the way our attendees want it to look. We have some big ambitions for how we can have break-away ChangeMaker weekends, leadership workshops, and special panel discussions. I’d also love it if in five years’ time, we are able to invite a ChangeMaker to speak who first attended ChangeMaker Tuesdays as a guest, and has since gone on to create their own change. Finally, I’d be incredibly excited if we could launch ChangeMaker Tuesdays in five more African capitals…there’s a phenomenal number of ChangeMakers in Africa to give a platform to! What five words would you use to describe ChangeMaker Tuesdays? Sorry, did you say five or fifty words?! Who would be your dream guest speakers? There are a number of people throughout history that have been such influential and phenomenal ChangeMakers, that they stand out time and again as people I’d love to meet and hear from. A couple of these would be the earlier mentioned wise man Mahatma Ghandi, and of course Nelson Mandela whose words have stuck with me, particularly ‘Education is the most powerful weapon which you can use to change the world’. However closer to home, one very inspirational Australian leader that I’d love to have speak at ChangeMaker Tuesdays, is Julia Gillard. As the first female Prime Minister of Australia, Julia is a personal inspiration – particularly her passion for global basic education for all, and her killer speech calling out misogyny in Australia. Finally, John Oliver would definitely be a dream guest speaker of mine; I like the way he uses humour and sarcasm to rant on about important issues such as climate change, human rights and gun control. He makes difficult and often contentious issues mainstream and accessible. You can keep up to date with ChangeMaker Tuesdays by following them on Facebook. Their events take place on the first Tuesday of every month, at Asni Gallery, from 6-8pm. What a wonderful group you all are.And what a platform for change in Africa!! Amy ,your humour is always a pleasure.Keep up the good work.